This slaw salad has a flavor that reminds me of the dry Ramen noodle salads without the noodles. 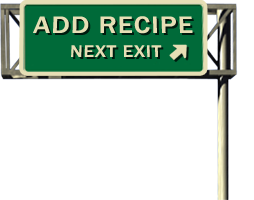 It is easy to make from ingredients found in almost any grocery store with the exception of the ginger which is a key flavor. The dried ginger slices can be a little hard to find on the road. I get mine from the Penzeys Spice Store. You can order from their web site or through their mail order catalog. I usually only need a little ginger for the recipes I make. Dried ginger travels well and is much easier for me than trying to buy a small amount of fresh ginger on the road only to end up wasting most of it. You could add onion, bell peppers, or any other crisp veggie you have on hand but it is delicious even without those additions. Soak the dried ginger in the vinegar for at least 20 minutes. Remove the ginger, add the garlic, sesame oil, sugar, salt, pepper and stir well. 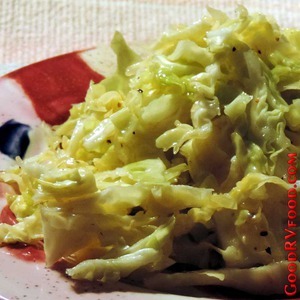 Toss with shredded Napa cabbage and serve.